Transcripts of the KRLA 5 Action Balloon in use before it was decommissioned. Ron Hailman: We now go on to our continuing coverage of Storm Watch 07, lets check in with Chase Faire high above the city in the KRLA 5 Action Balloon. Chase? Chase Faire: The storm is in full swing, and from what I can see, and that is not much, it shows no sign of letting up, but it shows definite signs of continuing to fire lightning extremely close to local hot air balloons. Ron: And how does all of this seem to be affecting traffic. Chase: Hot Air Balloons should expect to experience a multitude of problems as this low pressure front moves through the area. It really is a terrible time to be inside a balloon. Ron: No Chase I meant the car traffic. Chase: Unfortunately the high winds have blown us significantly off course. However boating traffic seems to be light currently. Ron: Thanks Chase, we’ll check in with you later. Ron: A high speed chase between the man suspected of kidnapping young Renee Washington and the Los Angeles Police has erupted in downtown Culver City. 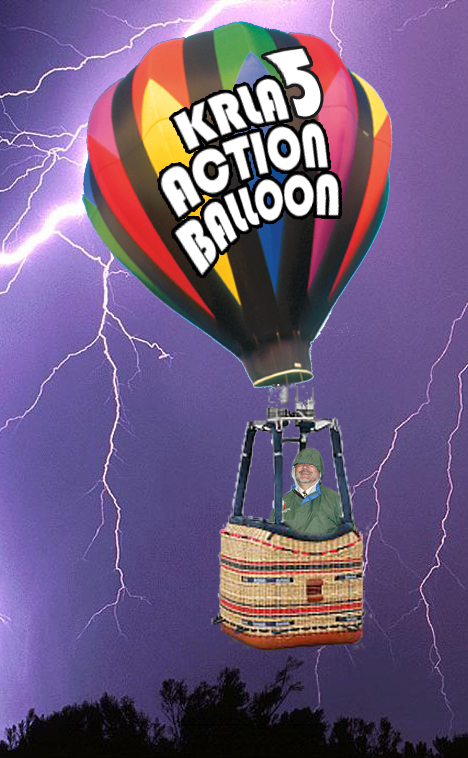 We go live to Chase Faire who is on location in the KRLA 5 Action Balloon. Chase? Chase: It looked like the police were gaining on the suspect when they passed below me minutes ago. Ron: And where are they headed? Chase: They were headed south and from how fast the moved out my site range, I would say they were traveling in excess of well over 25 mph. Ron: Any sign of this coming to a peaceful conclusion. Chase: We hope to have an update for you as soon as a strong southerly wind happens. Back to you Ron. Ron: Hot diggity dog, people love a good hot dog and with the world famous Pink’s offering a 2 for 1 special in honor of their 50th anniversary its no wonder that some of the longest lines this L.A. institution has ever seen are happening right now. For more we go to Chaise Faire in the KRLA 5 Action Balloon. Chase? Chase: Thanks Ron. From what I can make out the people in line seem relatively happy as there appears to be no action on a grand scale taking place. But what I can say is, even from this height the faint smell of hot dogs is making my mouth water. “Hey toss one up guys!” Ha. Just kidding. Back to you Ron.